Students and staff at Remington Traditional School participated in World Read Aloud Day, a global celebration of reading, by hosting a series of author Skypes throughout the day. 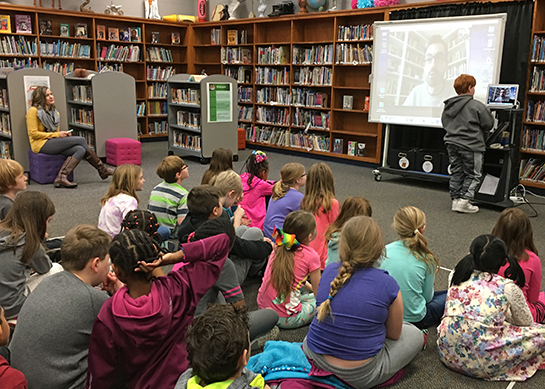 A variety of authors from across the country read to Remington students via the magic of online video teleconferencing and then answered their questions about their books and their writing life. Teachers and library media specialists throughout the Pattonville School District regularly engage with authors across the U.S. throughout the school year in order to build excitement and connections around reading for their students. Author Skypes are one tool the teachers use, but they also take to Twitter to engage authors; host author visits and book signings; and stage book battles with area schools to make reading fun and relevant. Close partnerships with local indie bookstores also support efforts to bring authors into the schools and build interest in reading. During World Read Aloud Day, Remington students from different grade levels interacted with the following popular children's authors: Sarah Albee, Jarrett Lerner, Stacy McAnulty and Miranda Paul. Remington students ask questions of author Jarrett Lerner via Skype during World Read Aloud Day.